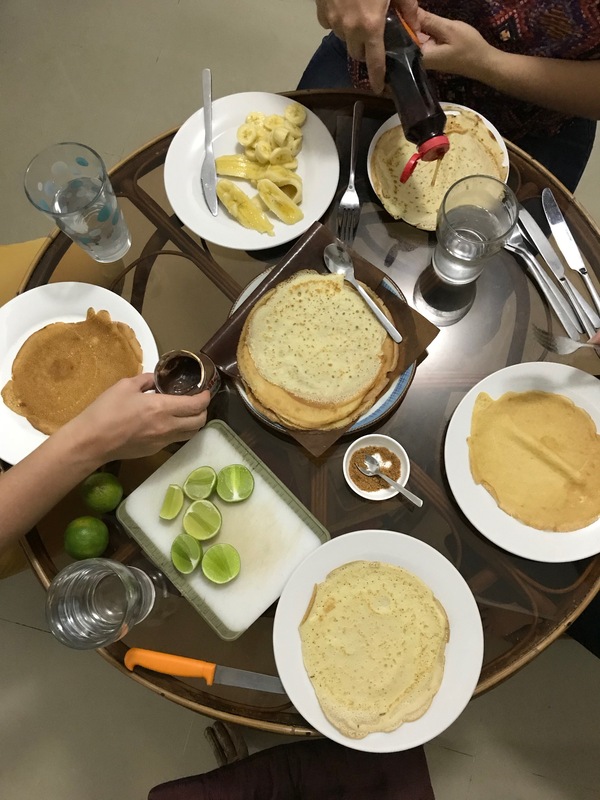 Then when I moved to Cambodia five years ago, French Esther was the resident pancake/crepe queen. 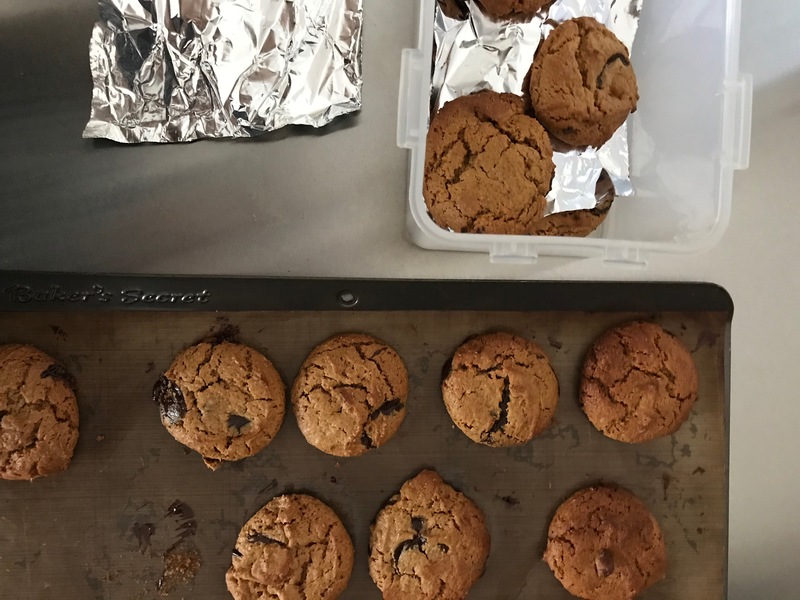 She followed a recipe of sorts and shared it with me once. I wrote it on the tiles of my kitchen, but when I moved the recipe was wiped away. Just so that we’re clear. I’m talking about English pancakes here. Not the fluffy North American variety or the Scottish drop scone cousin, Scotch pancakes. On Shrove Tuesday, I’m a fan of the traditional thin, light, slightly crispy, English pancake, drizzled with lemon juice and sprinkled with brown sugar. 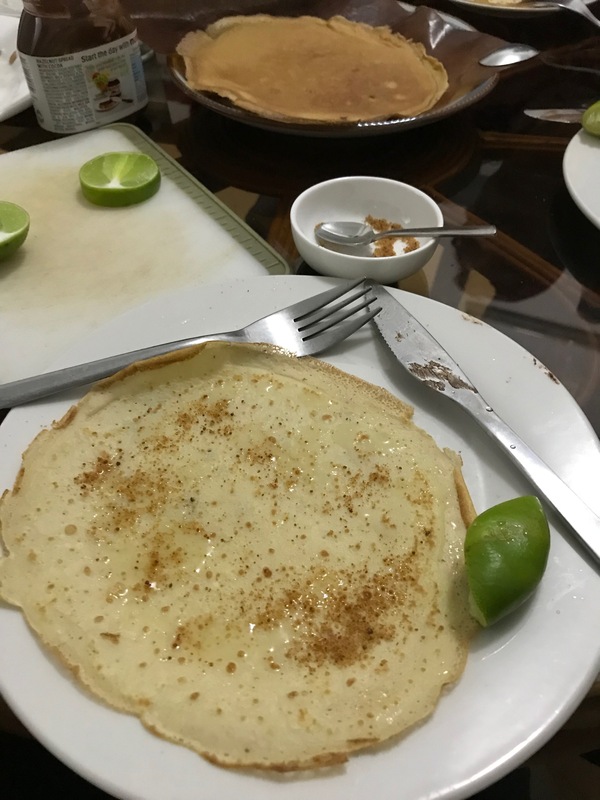 Pancakes with lime juice and palm sugar: a Cambodian twist. 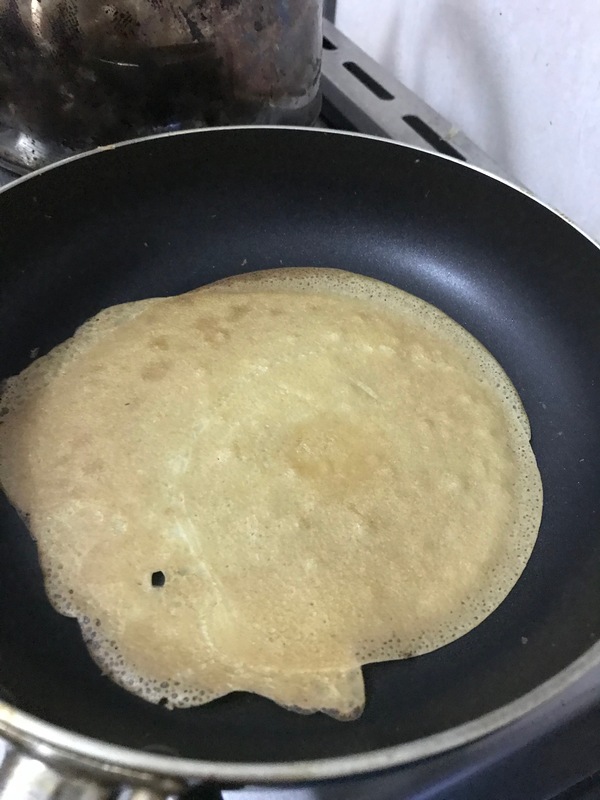 Then, last year, after decades of cooking pancakes, suddenly I realised that I did not know how to make the pancake batter and the traditionalist in me wasn’t going to intuitively make them as the others had. So, I looked up Delia and we had pancakes. Except I chose to use my bamix mixer to make them. Why not? 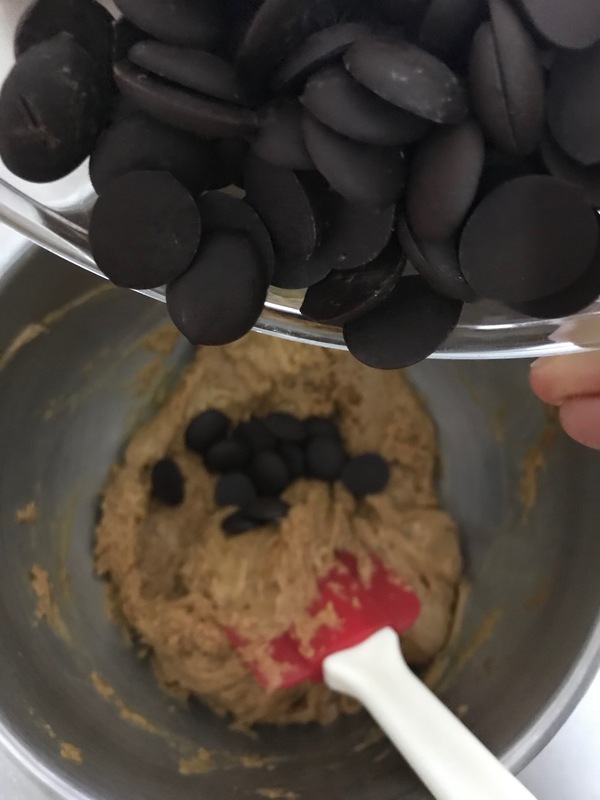 If you have a food processor, it’s much quicker to put all the ingredients into one and process it until you have a smooth batter. It takes a bit longer if you want to do it by hand, using a whisk. I’ve included the instructions, having followed both methods. In Delia’s original recipe she adds 2 tablespoons of melted butter to the batter. I’ve looked up why one should add butter to the pancake batter. (Sarah nor Esther ever did.) Felicity Cloake tried it and says it gives a better tasting pancake but in the end decided to cook the pancakes in the melted butter rather than adding it to the batter. I have a theory that it’s to use up/add more fat, as Shrove Tuesday is the day to use up fat before the start of Lent. 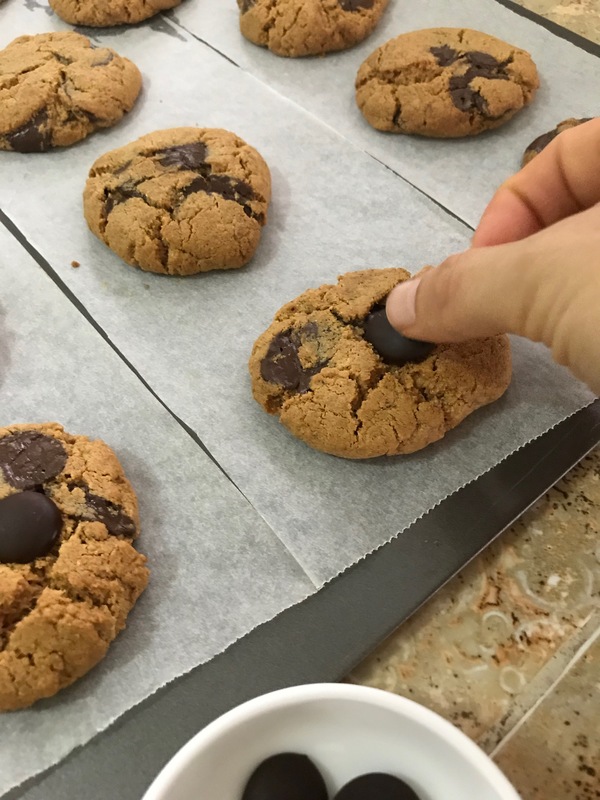 Rather than add butter to the batter, I prefer to use whole milk to add richness. And controversially, perhaps, I eschew cooking the pancakes in any fat. I like to use a small good non-stick frying pan, set it on a moderate heat, swirl in just enough of my batter so that it covers the frying pan and gently cook my pancakes on it until there are bubbles forming on the bottom and it comes away easily from the pan. Flip it over, anyway that you like, cook it on the other side for another minute or two and you’ll have good, thin, crispy English style pancakes. I find by cooking it like this, I rarely have that dud first pancake that has to be thrown away. Then all you have left to do is choose your favourite toppings, et voila. Munch away. Here are the pancakes, adapted from Delia, this will make about 14-16 pancakes. Put all the ingredients into a food processor or a blender. Blitz up until smooth. 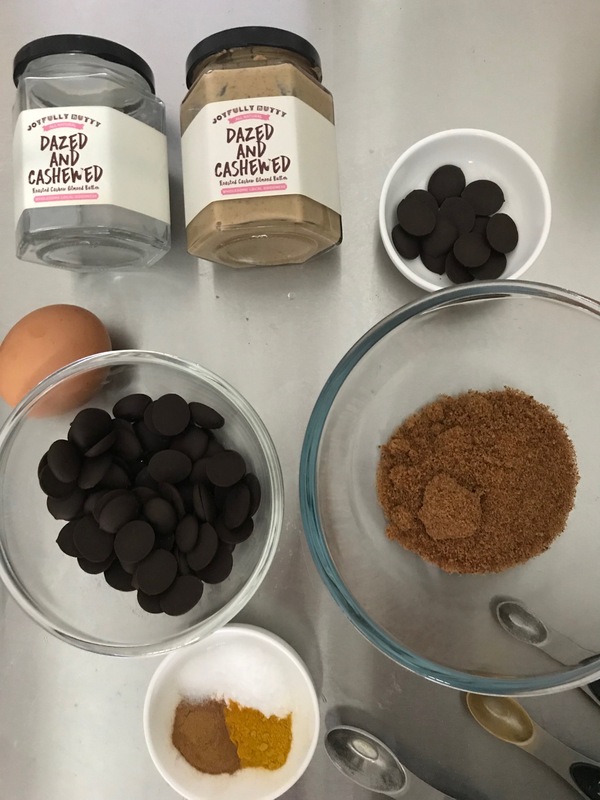 Alternatively to make them with a whisk, put the flour and salt in a medium sized bowl. 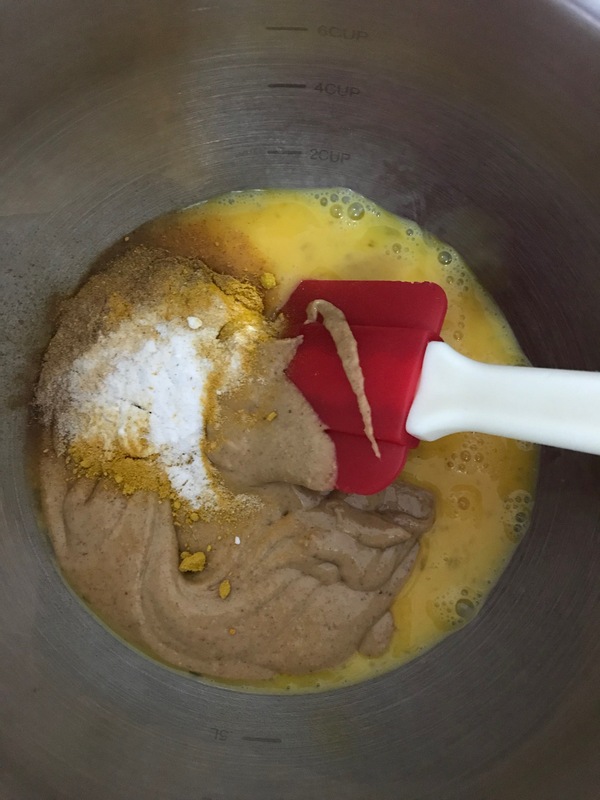 Add in the eggs, as you whisk them in the flour, slowly add the milk until you get a smooth mixture, the consistency of cream. It’s ready to use immediately, or you can leave it to rest in the fridge for at least 30 minutes. 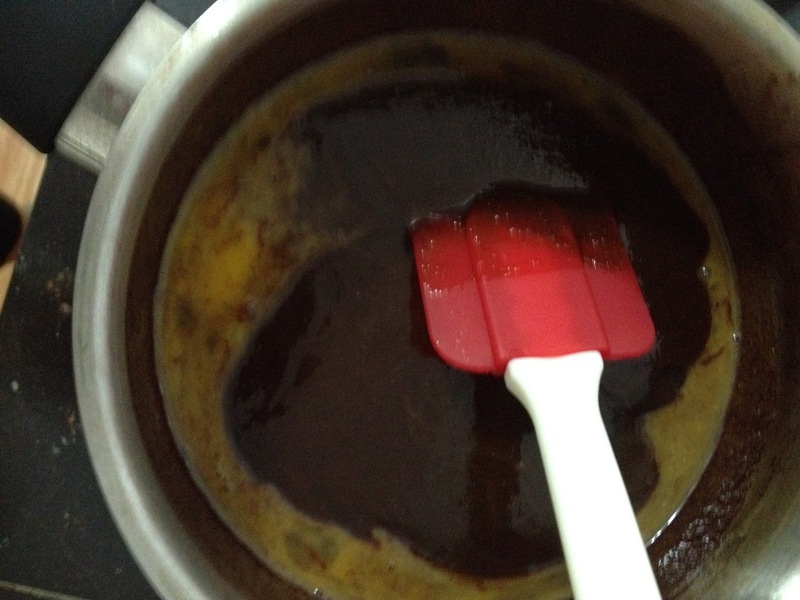 This also means that you could make the mixture beforehand so that it’s ready for a pancake party. Using a small non-stick frying pan, use a moderate to high heat and pour just enough batter into the pan, swirling it around so that it covers the pan. (I’ve linked this to a video but it takes some time to load up.) 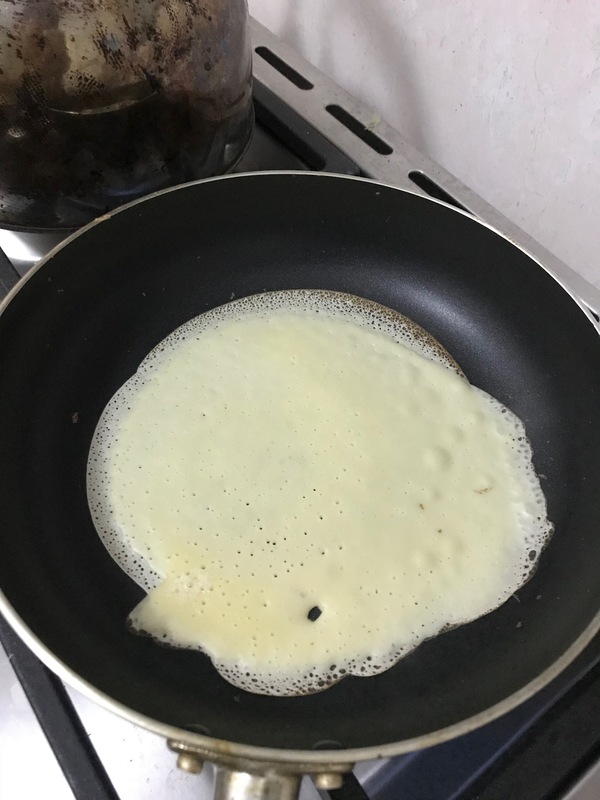 Gently cook the pancake until small bubbles form on the bottom and it comes away easily from the pan. Flip it over, anyway that you like, cook it on the other side for another minute or two and serve. If you want to get started on pancakes before your eating companions arrive, then keep them warm in the oven. 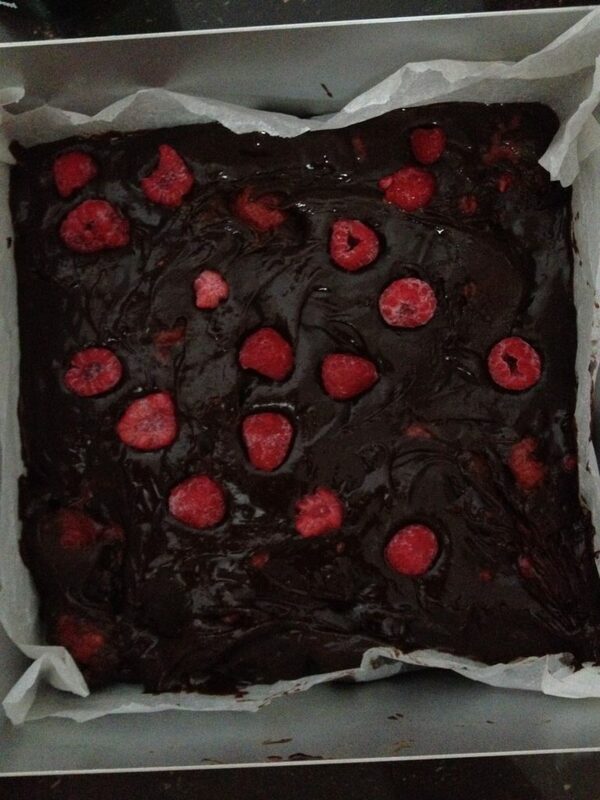 I stack them on a plate and cover with foil before putting them in a warm oven, which is set at a low temperature. 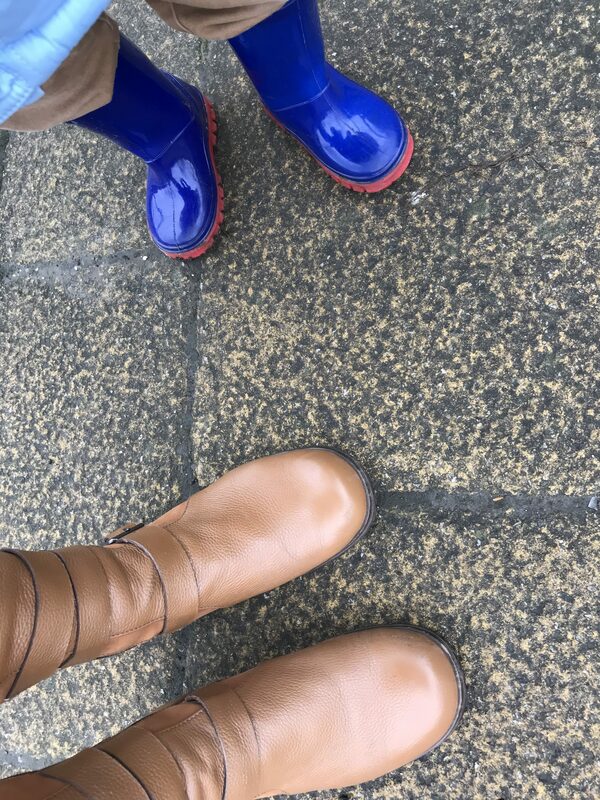 Life runs a bit slower with these wee feet alongside you. As you know, I live in Cambodia. Since the birth of my nephew, anytime I visit the UK, I’ve taken to spending a couple of weeks at my sister’s and hanging out with my nephew (and my sister and brother-in-law). This time at 18 months old, it was an absolute delight to see more of his wee personality coming out. Thoughtful, inclusive, at times ever so sweet, commanding, wanting to be helpful and involved, he made us laugh A LOT. So I wrote this poem to capture this moment in his development. I have my own bowl, plate and hands. “HhUM”, I say, when I want something you offer me. You’ve given me a fork and spoon? Mess makers on my face and floor. “No.” I don’t need your help for that. with my knees and palms. Stay 2 feet away from me. So that we can all go outside. And I know which direction our walk should take. down them. Walk over black and white stripes. “Ddu- Ddu-” that go “wak-wak”. “Ball” is my favourite game. When I wake up, “ball” is where I run to. But a tangerine or a stacking up cup works too. If you throw “ball” to me, I will like you. when it hits my head too. I love to play with “ball” so much. Wrapped up in my thick coat and wellies makes me happy. ‘Good job.’ ‘Well done.’ when I send the ball to them. like it doesn’t want to play with me. Uh huh uh huh HUH HUH HUH. I make my ee-mo* run and kick it back to me. “Der” I point to the big screen. I love it more when we dance together. And I can do that too. *ee-mo: 이모 in Korean. Translates as aunt in English. This is the basic form for what you call your mother’s sisters. Your father’s sisters are addressed as 고모 (go-mo). Ah, *rueful smile* – the specificity of korean titles. For a more detailed overview on the Korean family and kinship terms, check out this blog post on the talking cupboard. Posted on January 23, 2018 October 2, 2018 Author Han-Na ChaCategories PoetryTags poetryLeave a comment on I’m 18 months old and I can do that too. I never knew that fruit cake could be offensive. That is, until Kiley, an American friend of mine, explained that in the U.S, there’s this tradition that people tend to ‘re-gift’ fruit cakes because they don’t like fruit cakes. Hence those receiving the cake are kind of being told, “Here I’ve brought you a cake. I mean, I don’t like it and someone gave it to me. I guess you probably won’t like it too but hey, now it’s your problem. And no, I didn’t like what you got up to at the office party.” Hence, there’s offence in the giving and receiving of fruit cakes in the States. Lining this 8inch cake tin for its looooong bake. Not so in the UK. I mean, some Brits really dislike fruit cake and would spit it out. 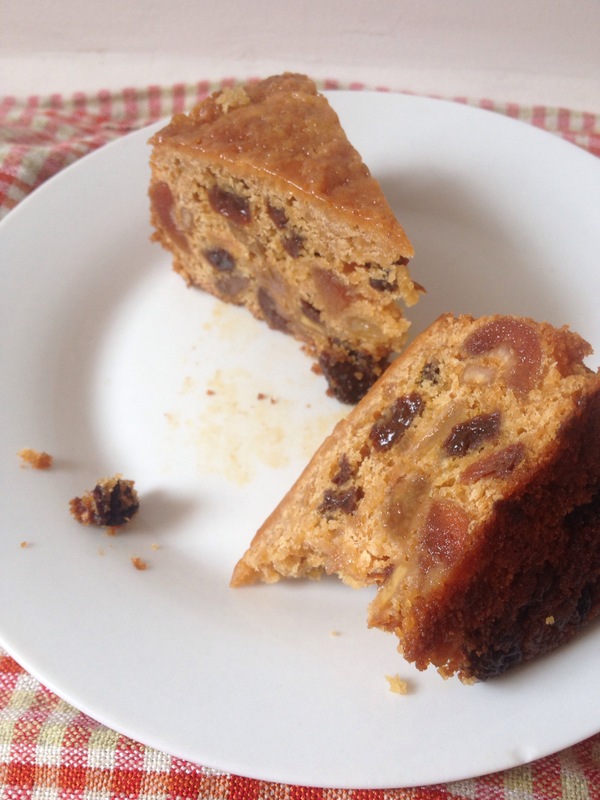 However, most like to eat fruit cake at any given time, from celebrating marriage with a rich boozy fruited wedding cake covered in marzipan and icing to the everyday cup of tea with a sticky slice of fruited malt loaf. Shall I even mention Christmas cakes, Easter simnel cakes, Dundee cake..? My mum used to make a fruited tea loaf which was delicious when toasted and buttered. Perhaps (if I may venture a guess without causing offence) this clear cultural divide over fruit cake is because the majority of Americans have never experienced a good moist fruit cake? I can relate! I never really enjoyed eating fruit cake very much either growing up. Much like how I didn’t really enjoy mince pies. Too rich, too sweet, too dry, too much whiskey! But I tolerated them because they were synonymous with Christmas. I’d peel off the royal icing, give it to my brother and nibble away at the marzipan (which I loved even as a small child). Sometimes I picked out the fruit when there was too much of it and the dried fruit was really dry and almost bitter. Or the alcohol overwhelmed the cake. 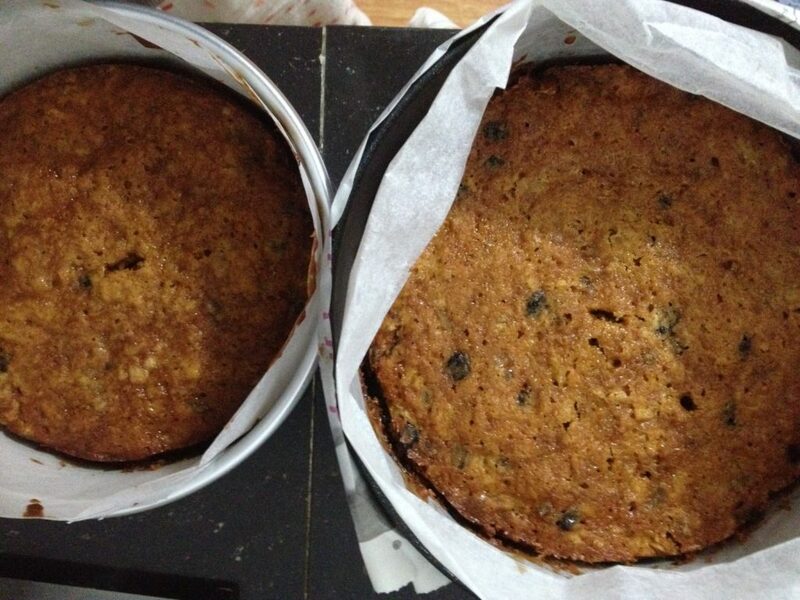 But, from time to time, a homemade fruit cake would redeem all the bad ones for me. Then one day at Mrs Milne’s* house, she gave us a slice of her christmas cake. Oh it was glorious in it’s moistness, flavour and simplicity. Not overly sweet. No royal icing. No marzipan. No alcohol in this one either. Just. a. naked. fruit. cake. Mrs Milne told us that it was the addition of pineapple that set this cake apart, and I believe her. Whenever I’ve used pineapples in a cake, they often impart moisture, rather than pineapple flavour to a cake. 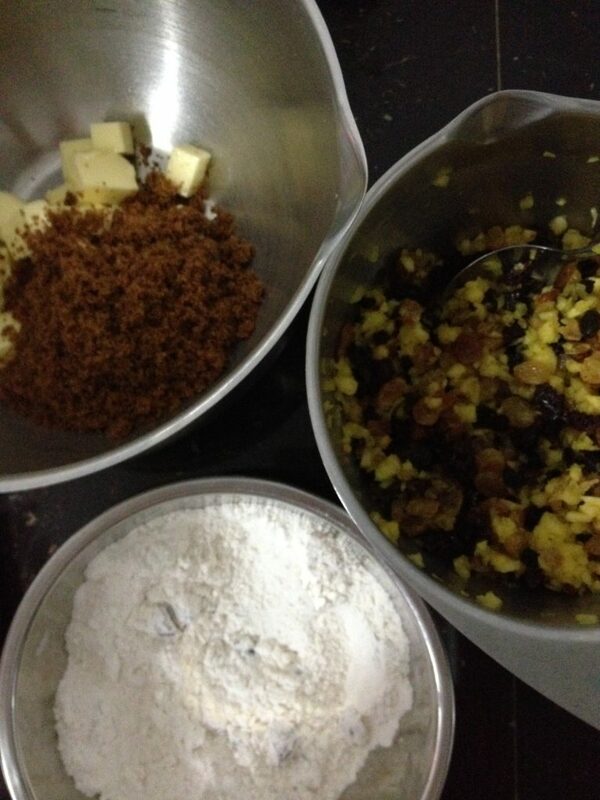 Now, over a decade later, it’s still my go-to fruit cake recipe. I used it as my marathon training cake this time. It seemed apt to fuel up on. 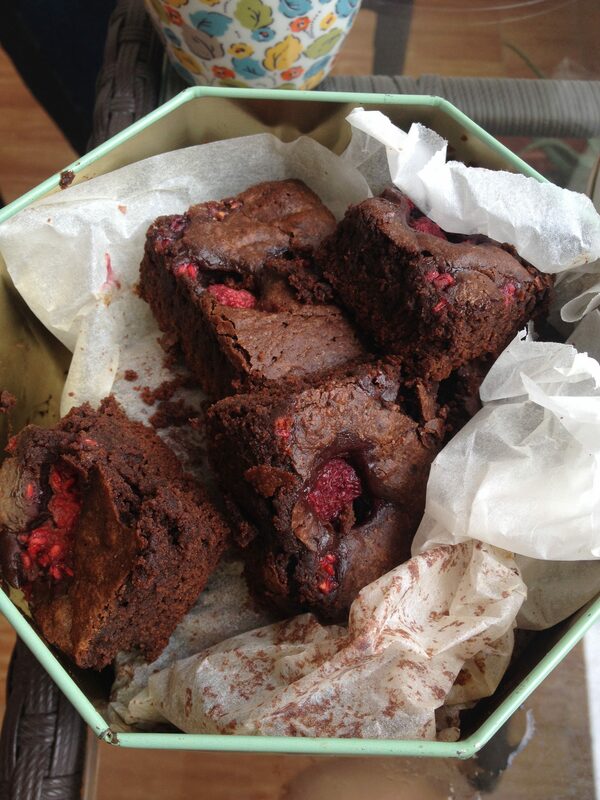 I left it a couple of weeks in a sealed container in the fridge while I went on holiday to Penang and 4 weeks on, it was still moist and moreish. I baked it for Christmas for Paul, one of my colleagues, because he’d been hankering after fruit cake for as long as I’d worked with him. 3 months on, he still requests I bake him one, once a fortnight, and then complains that he can’t stop himself devouring it. He likes royal icing but not marzipan, so that’s how I make it for him. 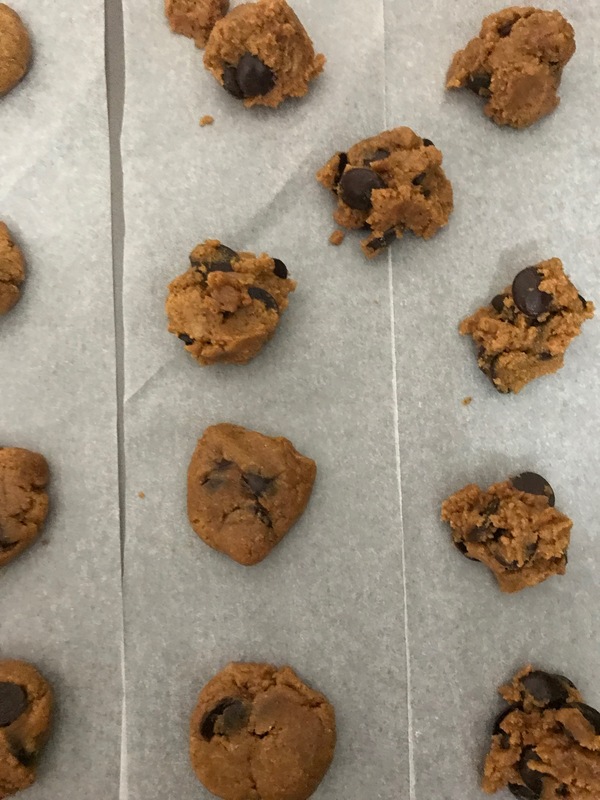 What I love about this recipe is the lack of planning required. See, I just can’t be bothered with the whole affair of soaking and feeding the fruit weeks or even days in advance. I don’t have the fridge space for it and I definitely don’t want to leave it out for the ants, cockroaches and rats now that I live in the tropics. 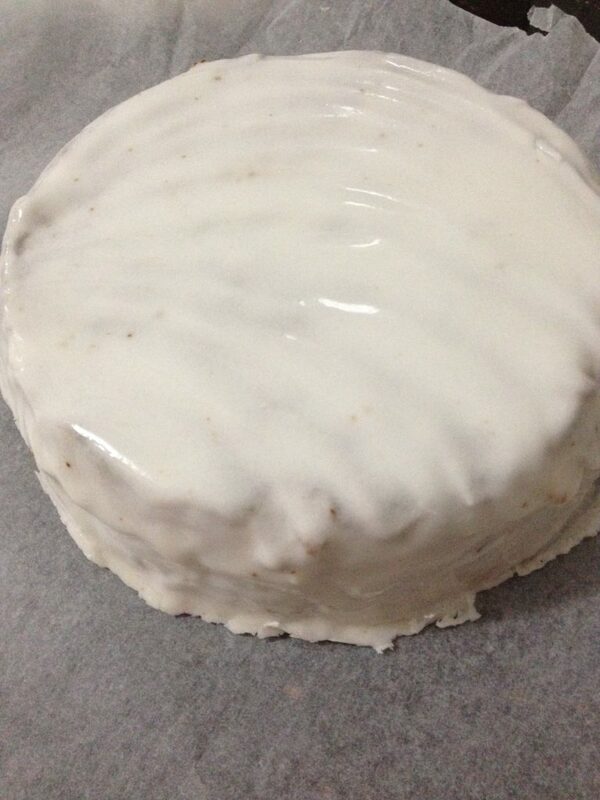 I can pretty much make this cake from start to finish within 2-3 hours, depending on which cake tin I use. (more on that below). And now that I can source almost all of the dried fruit here in Phnom Penh, there’s nothing stopping me making this cake all year round. I still have difficulty finding mixed citrus peel and currants, but it’s so much better compared to 3 years ago. You can buy bags of mixed dried fruit in Thai Huot but they look weird with chopped red and green cherries perhaps? So I came up with my own measurements, based on looking at the proportions of the ingredients of a Sainsburys bag of mixed dried fruit. Anyway, what’s stopping you. Go on, I dare you not to like this. If you do add brandy, or whiskey… Then do tell me what you did. I’ve never bothered, but I might like to one day. *Mrs Milne was my singing teacher from when I was 14-18 and one of those wonderful, life-giving, energetic, charismatic, generous Scottish women. I don’t know where she got this recipe from, so I attribute this recipe to her. Ingredients for Naked Christmas Cake from Mrs Milne. 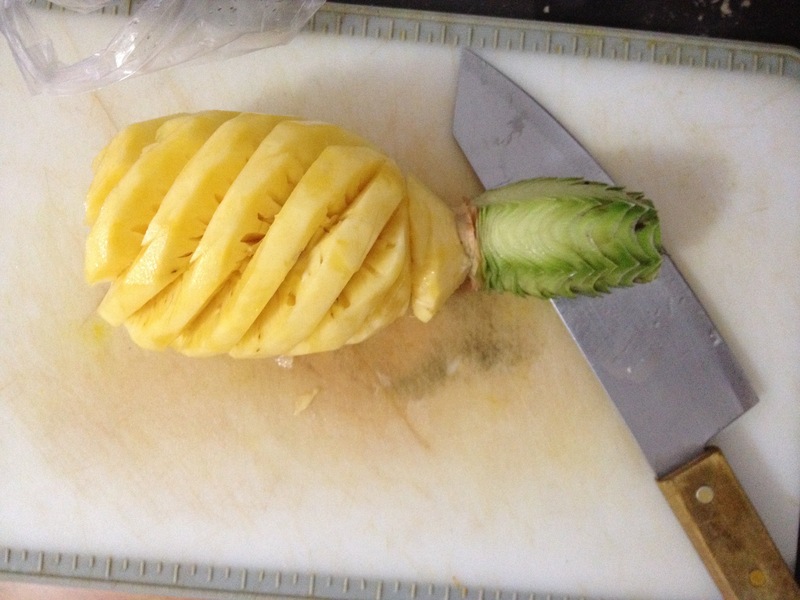 8oz/225g tin crushed pineapple (drained) or 1 fresh small pineapple, skin and eyes taken off. One weighs between 250-300g here in Cambodia. 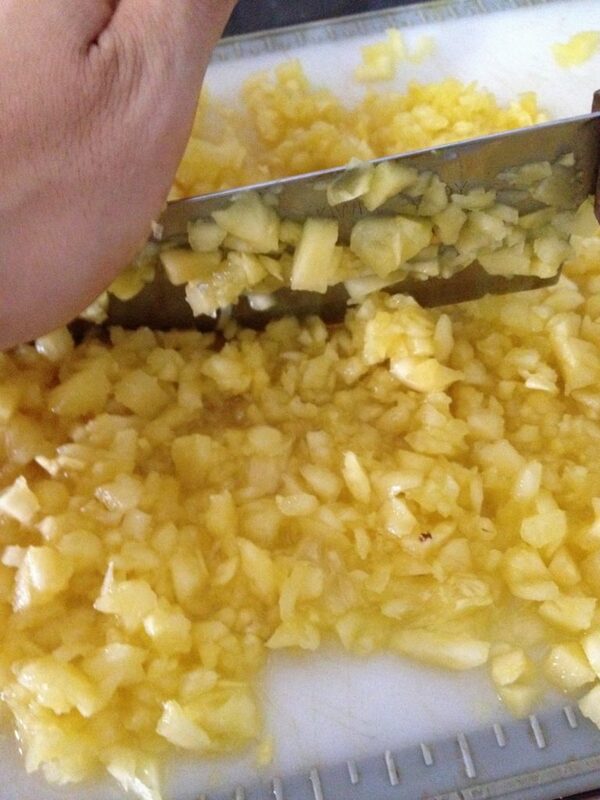 Chop up the pineapple* very finely and put it into a medium sized bowl. I guess you could also blitz it in a food processor for speed, but I don’t have one so it’s a knife and the chopping board for me. *If using tinned pineapple, drain the crushed pineapple first before putting it in the bowl. Measure out the dried fruit and add them to the pineapple. If you’re going to add brandy, then add it in now. Give it all a good stir so that they mix well. Leave it as you get on with the rest of preparation. As the dried fruit sits with the pineapple, they’ll get a chance to plump up as they soak in the liquid. Preheat the oven to 160ºC/320ºF/Gas Mark 2½. Prepare your cake tin. 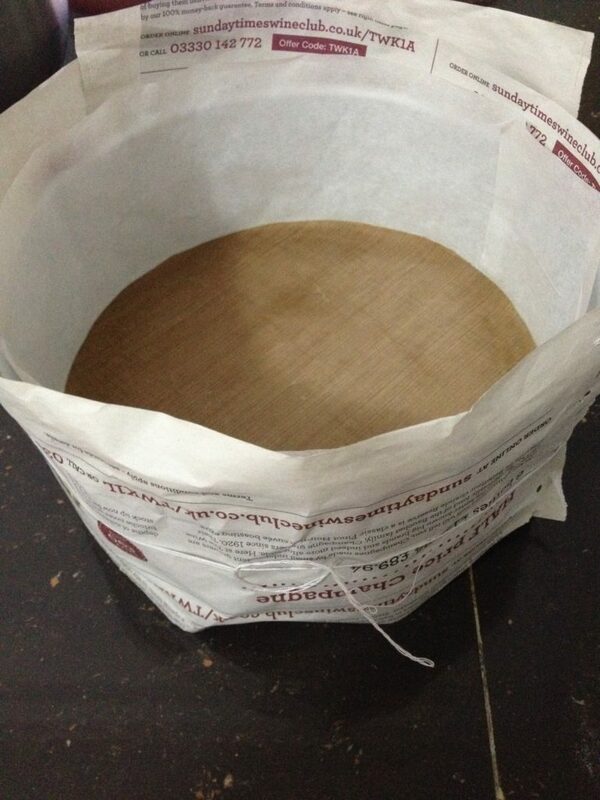 Because of the long baking time, I wrapped the outside of my baking tin with newspaper, tied it up with some string. I also lined the bottom and sides of my cake tin as well. 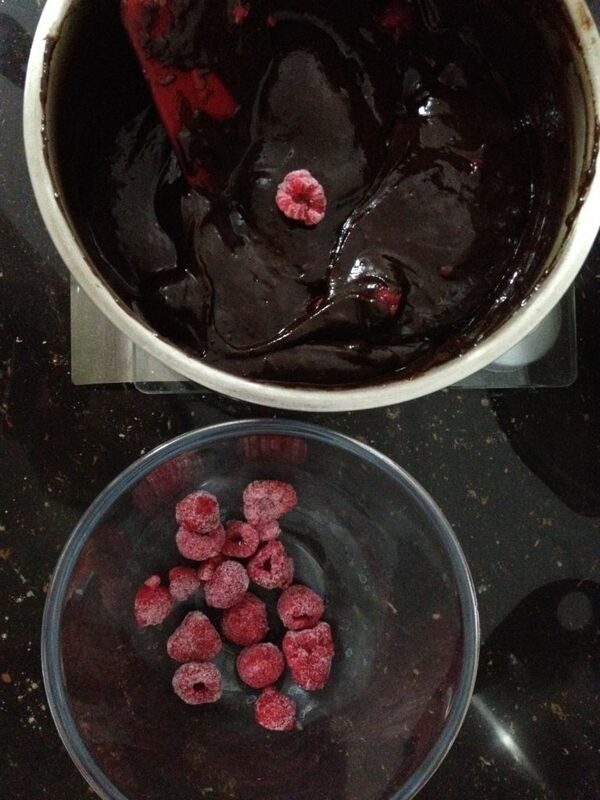 Measure out the flour in a medium sized bowl and add the chopped glacé cherries to the flour and coat them in flour. This helps the cherries not to all sink to the bottom of the cake. 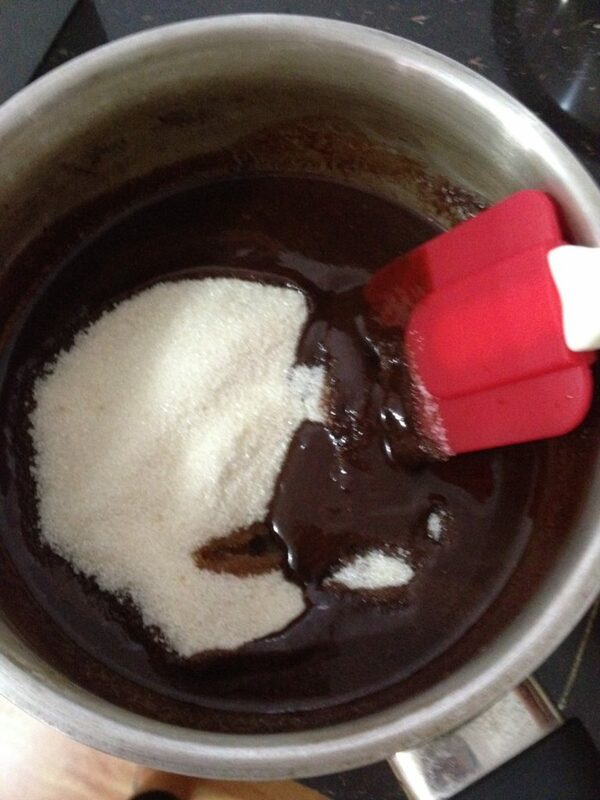 Cream together the butter and sugar in a large mixing bowl. I use a hand mixer on high speed for about 5 minutes. Next beat in the eggs one by one. Then lower the speed and mix in the flour with the cherries. Finally, add the fruit. 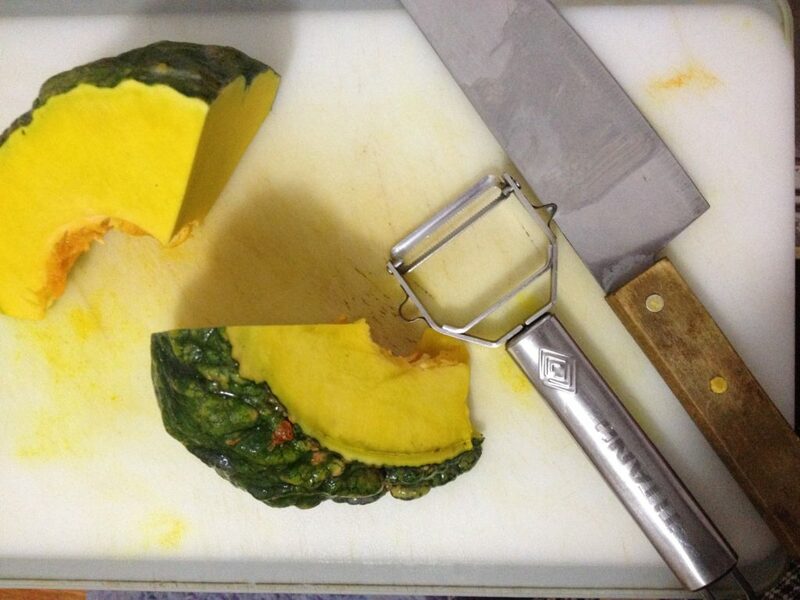 You can continue with the hand mixer, or using a spatula, fold in the fruit or give it a good stir. Whichever way you choose, make sure it’s evenly mixed in. 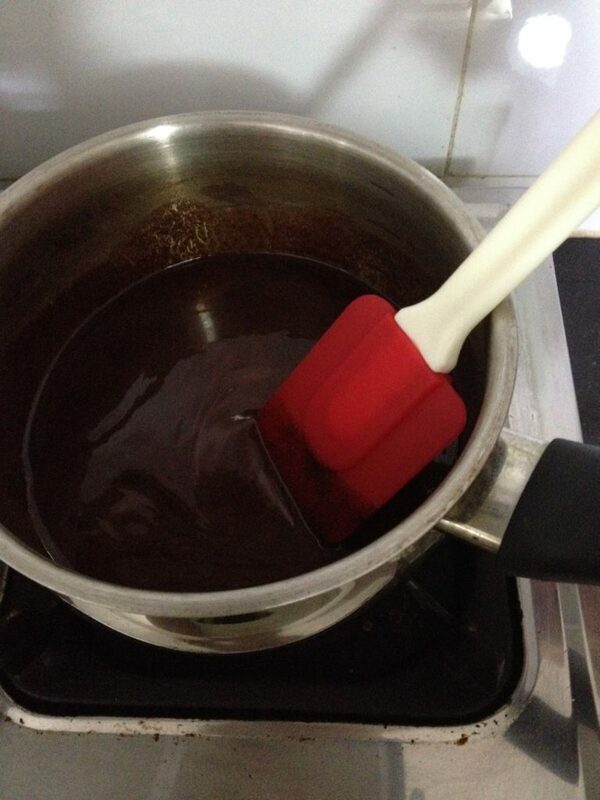 Pour the mixture into the prepared cake tin and level the top with the back of metal spoon or the spatula. Then pop it in the middle shelf of the oven and bake… I do recommend checking on the cake to make sure it doesn’t burn on top. I’ve put suggested timings below according to cake tin sizes. I have used various sized cake tins to make this and of course the baking time differs. 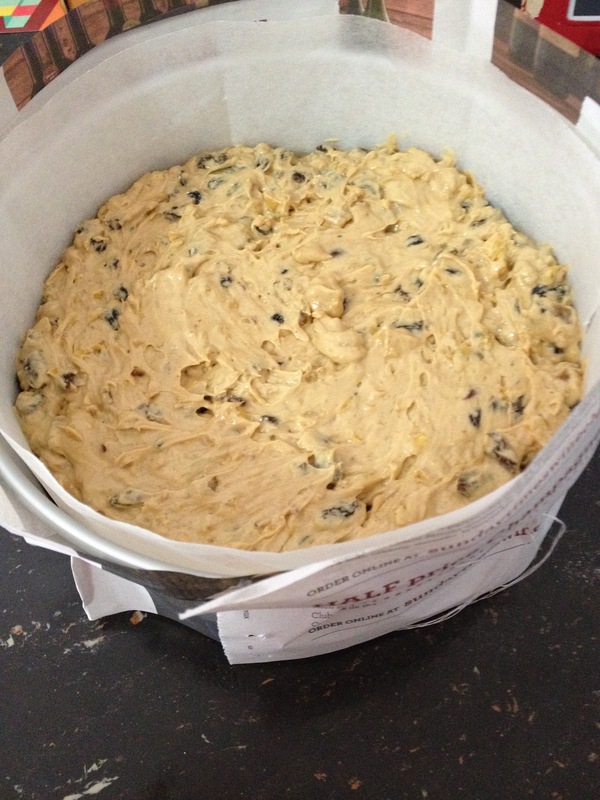 split the mixture into two 2lb loaf tins = 45mins-1hour. Check on it at 40 mins. My colleague, Paul, wanted it with royal icing but without the marzipan. So, this is what he got. Yes, hopefully. But that will done by a specialist. Bernardo needs some TLC. There’s an equilateral triangle mapped out on my chest. Like the night sky, and they are gods. 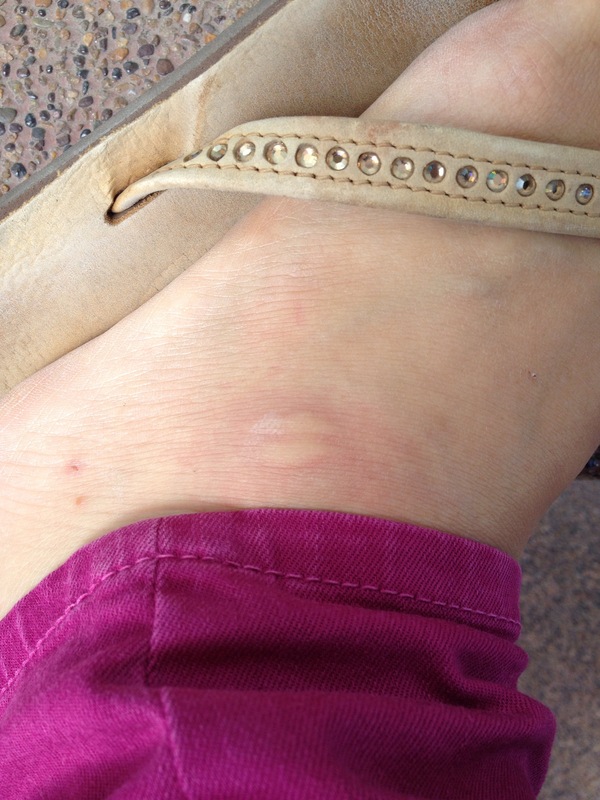 that I had measles or shingles, all for a moment. Dot. The Southern Cross. On my chin. About a year ago, I went to visit some friends and their hours-old baby at the Kantha Bopha children’s hospital at the riverside in Phnom Penh. Stirred by the din of our party of four’s arrival, this little boy opened his beautiful black eyes to take us in. “Hello, little one.” He stared back and then closed one eye. *LOL* He got me thinking about what it must be like as a newborn. Do they feel overwhelmed by this multi-sensory realm, full of new smells, noises and colour? We often think of babies as a tabula rasa, a blank slate, with no sense of self. And perhaps they are. But I wanted to invert that in this poem and imagine that a newborn could form their thoughts, as an adult, self-aware and with the vocabulary to match. I wrote out the first draft and then left it for a few months while life went on. And then along came little P.
This newest addition to the family has been lovingly provided by my sister and brother-in-law, in the form of a beautiful baby boy who came 3 weeks early. In actual fact, the moment my sister told me that she was pregnant, I began to miss Owotato, as I dubbed him (a conglomeration of their surname and potato). Now, she whatsapps me photos, we google hangout and she sends me wee videos of him. But in all honesty, what I long to do is hold him and blow air on his face! In the meantime, this poem, which is dedicated to him, will have to suffice. Perhaps if you came closer? Too late. Out they zoom. YES! The air feels cold on my skin. I miss the wet warmth. and shake my fist to test it. I can smell my mother’s milk. instinctively, it knows what to do. I am going to practise making the moves in my own time. I try to tell them. But they don’t seem to understand me. Oh hello! You smell different. What? This one likes blowing air on my face. I daren’t move my head. I won’t be able to bring it back. When I first arrived, I couldn’t afford to buy arborio rice here. 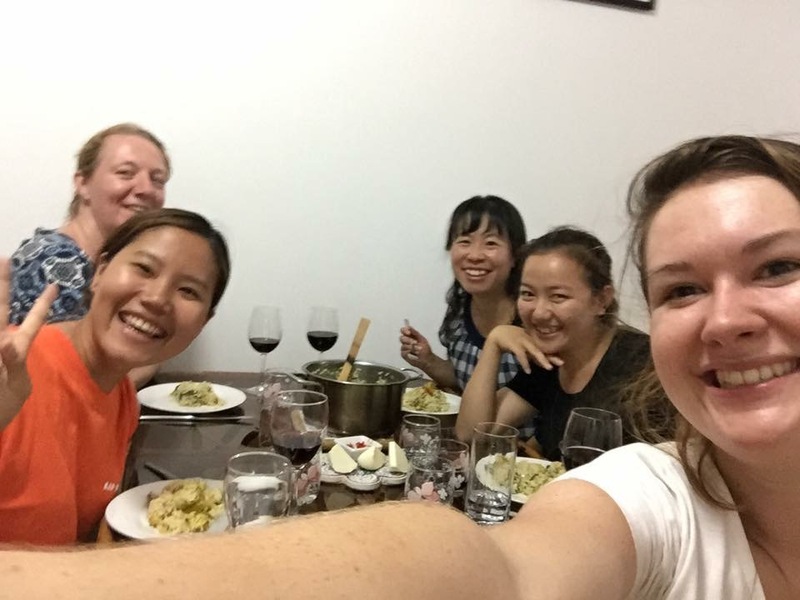 So, in that first year, I didn’t make any risotto, one of my customary meals back in the UK. Thereafter I got so desperate for the comfort of cooking and eating risotto, I managed to convince myself that it didn’t matter if I used jasmine or ginger flower rice (a Cambodian medium grain rice) instead of arborio, carnaroli or any different type of risotto rice. 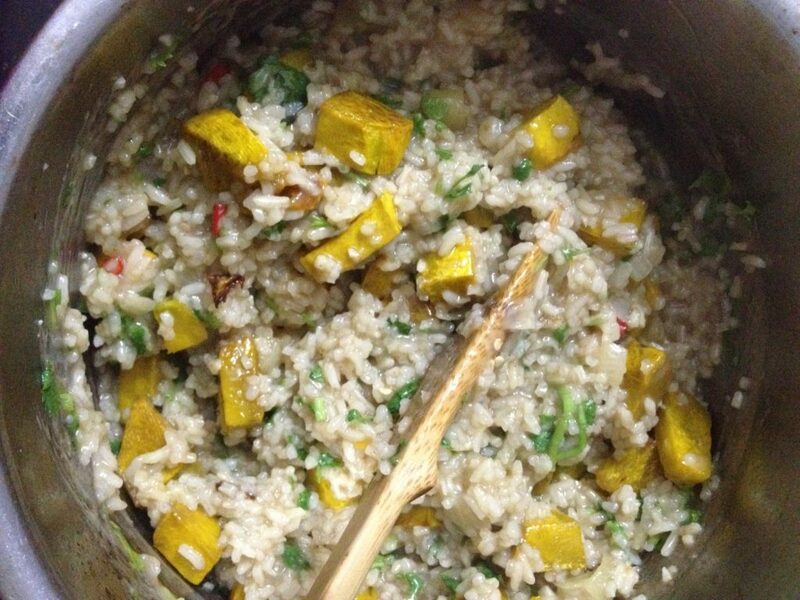 I’ve merrily been making and feeding this pumpkin ‘risotto’ to many of my friends, using whatever rice I had at hand. Believe me, there were no complaints. Spicy, and gloriously ochre with the sweetness of fresh coriander. Who would turn down this dish? However, a few months ago it all changed. My friend Robert gave me some of his delicious bacon, mushroom and spinach risotto (which I need to try cooking myself!) made with arborio rice. And the realisation of the error of my ways overwhelmed me. It just ain’t a risotto without risotto rice! How had I duped myself into thinking that this chewier, creamier textured rice could be replaceable? So, yes. 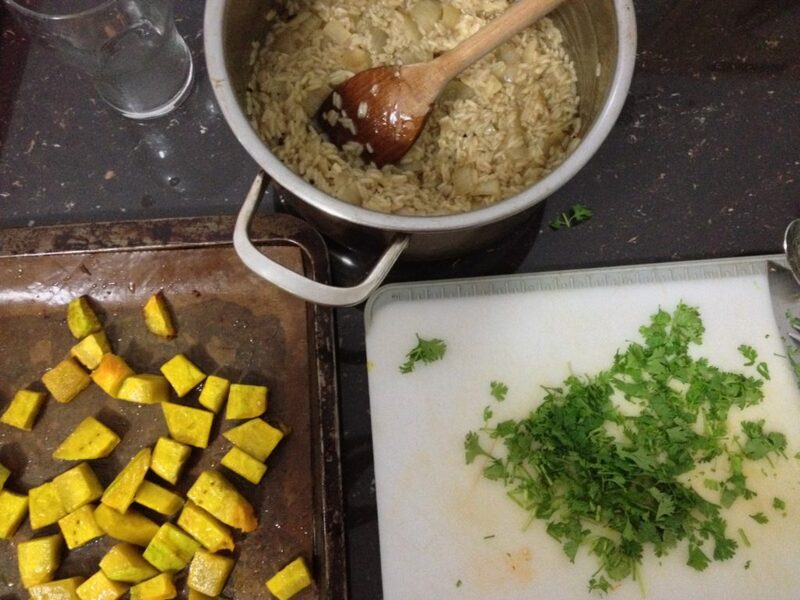 You can make this not-really-risotto, pumpkin risotto (what am I supposed to call it now?) with any grain of rice that you have. But don’t call it risotto. It’s really simple to make. 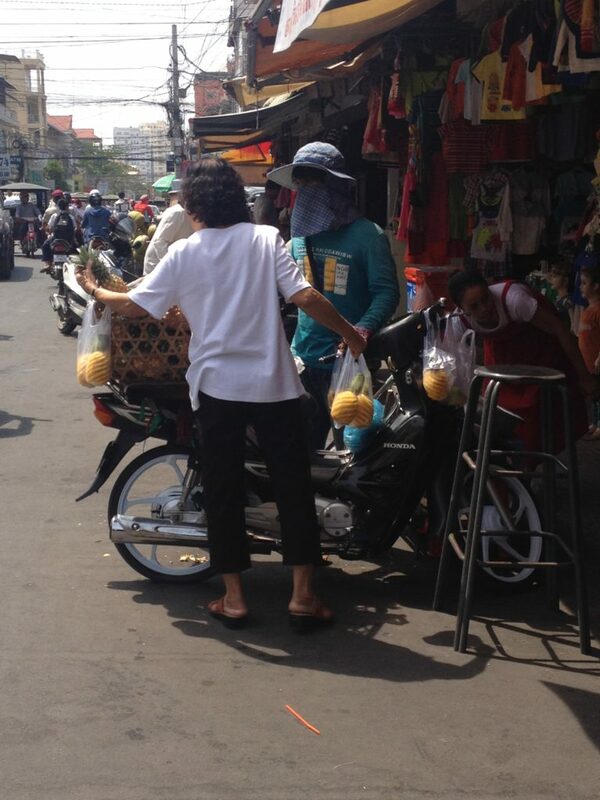 I make it a lot as pumpkins are pretty much available all year round in Cambodia, but not always strictly as a risotto. I really appreciate the fact that here you can buy however much of the pumpkin that you’re planning on cooking with: you just ask the market seller to cut off however much you need. In contrast, I don’t think that I would have made this in the UK because I didn’t really buy pumpkins. I didn’t really know what to do with a whole big pumpkin and I didn’t shop in those places that sold different varieties of smaller ones. I adapted the original recipe to add in a bit more spice, with extra cumin, chilli and coriander. Lastly, there’s the grown-up version with the added white wine. Preheat the oven to 180C/gas mark 4/Cut the pumpkin into fairly even 1inch/2.5cm cubes. As you can see from the photo, I don’t worry too much about being precise. Coat it with 1tbsp of vegetable oil and season with salt and pepper. 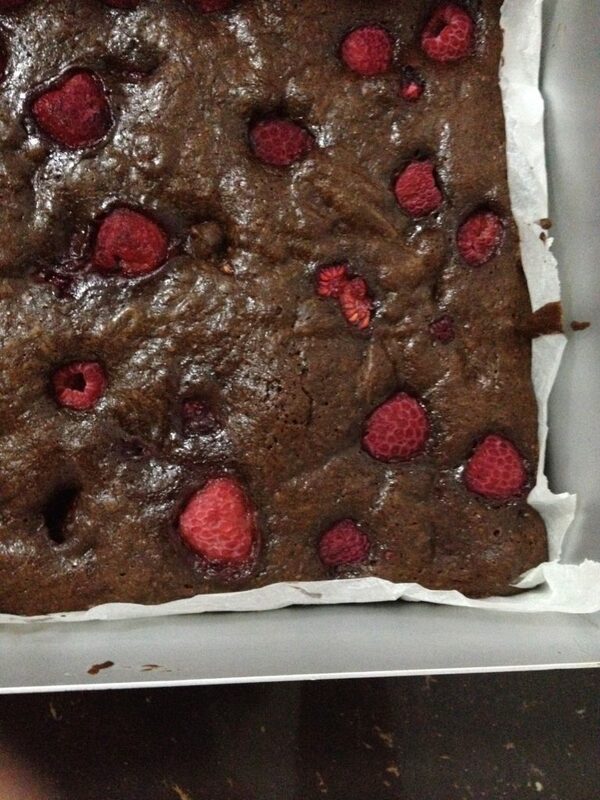 Bake in the oven for about 30 mins. Meanwhile get started on the risotto. Crush the garlic and chop up the onion. If using spring onions, then finely chop up the whites of the spring onions, reserving the green part as a garnish for later. Heat the rest of the oil on a gentle heat in a medium sized pan and fry the onions, garlic and spring onion until the onions are soft. Now add the cumin and rice, being careful not to let it catch on the bottom of the pan. 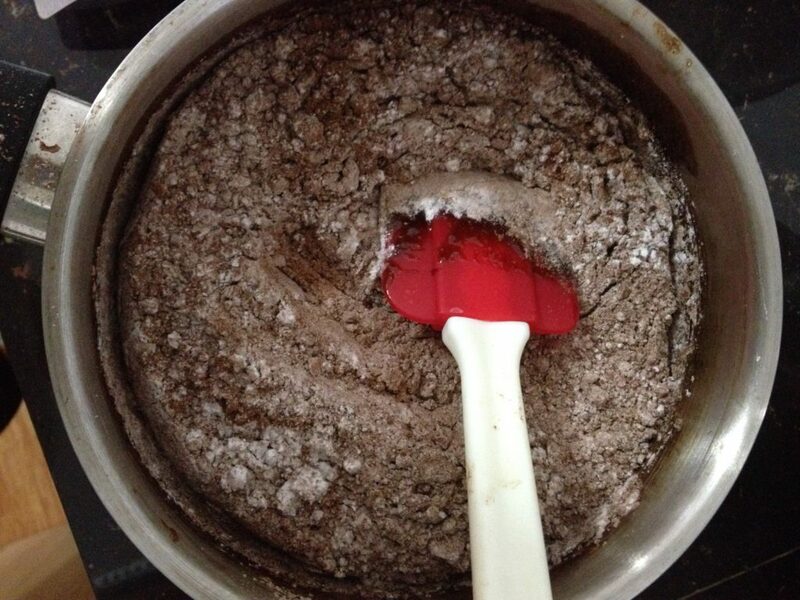 Stir so that every grain of rice is coated in the spice. Add the wine and let it deglaze the pan, by stirring it around the bottom of the pan. Next, adding the stock about a ladleful at a time is the accepted wisdom but I’m pretty imprecise about this. I think that add however much you need so that it just covers the rice and the rice won’t burn at the bottom of the pan. Stir and stir until the stock has disappeared this helps release the starch from the rice). Then add in a bit more stock. *As you’re doing this, multi-task with step 7. * Continue until the rice is cooked but still has a wee bit of bite – this is al dente. Add another generous ladleful of stock, this helps to create a sauce, and the butter. Cover with the lid to help the butter melt. Check on the pumpkin and remove from the oven once they’ve been baked. Grate the cheese, roughly chop up the coriander, finely slice the chilli peppers and the greens of the spring onions (if using). 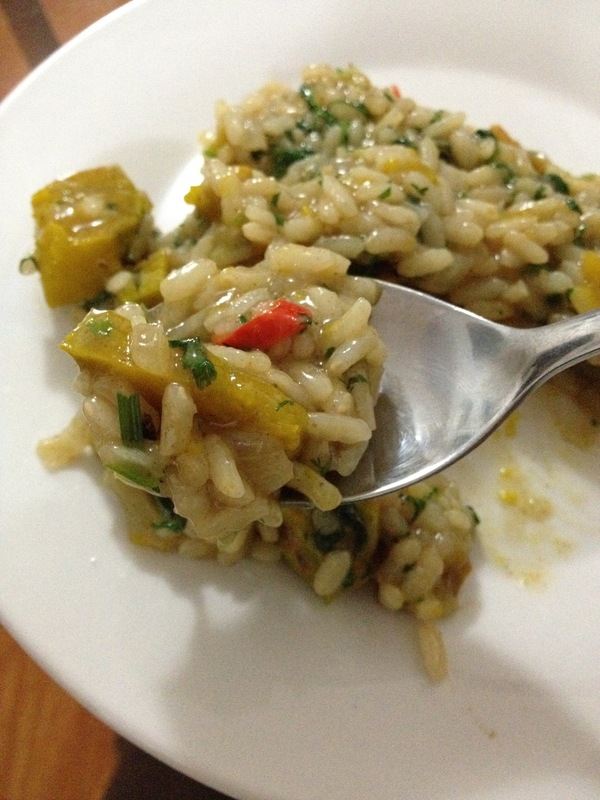 Once the rice has been cooked, add the pumpkin, cheese, coriander, spring onions and the chilli peppers. And stir through to mix well. If you’d like a bit of zest, sprinkle some lime juice on top. 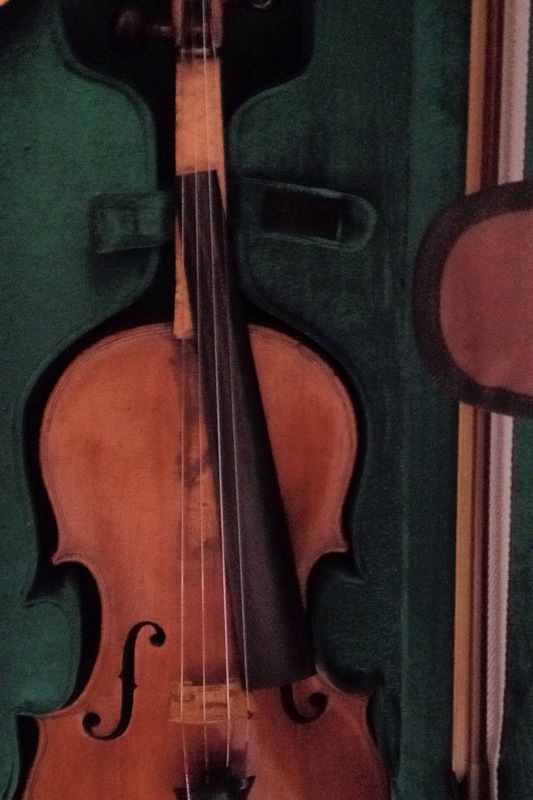 Et voila – enjoy. The verdict? A satisfying meat-free meal, which my friends, khmer and western, enjoy eating. I especially like this paired with kimchi.